Are You Talking with Other Parents? What’s It Like to Be 7 Months Old? Remember how you felt just before your baby was born and during those first hectic months? Now would be a good time to think about how your feelings as a parent have changed since that time. 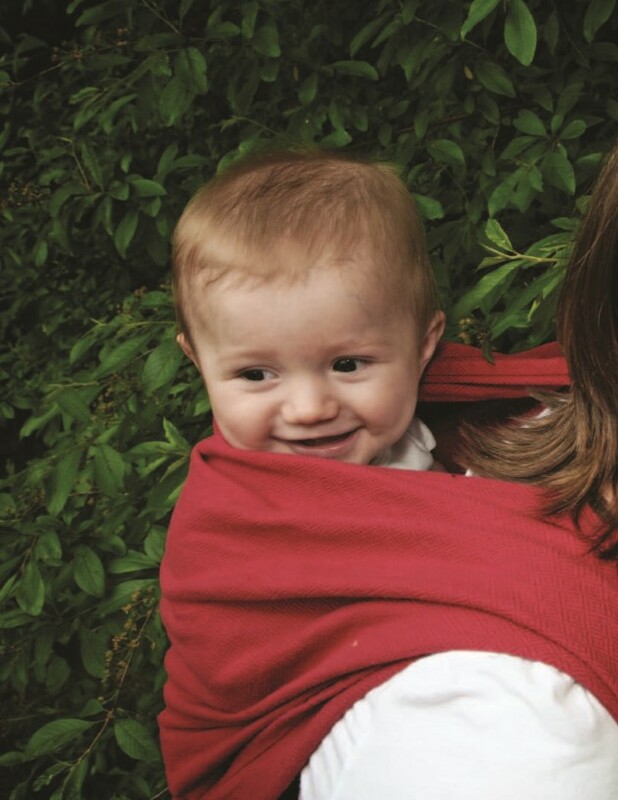 Are you feeling more sure of yourself and relaxed about bringing up your baby? Are there still times that you feel unsure of yourself and guilty that you’re not being the perfect parent? You know, there is no such thing as a perfect parent. We often expect too much from ourselves. It’s impossible to be patient, understanding, and loving all the time. We just try to do the best that we can. Yet many parents feel guilty and discouraged if they don’t live up to their expectations of parenting. They have a whole list of “shoulds,” such as: “I should always put the baby’s needs ahead of mine. I should always put things away so the house looks neat.” These shoulds are impossible to live up to. Where did you learn your shoulds? You might want to think about where they are coming from. Are they coming from your own parents or your friends? Don’t be too tough on yourself. Instead of putting yourself down with your list of shoulds, try to accept your feelings and realize it’s not easy to be all things to all people, even little babies. Remember, too, that no one’s perfect. Be a good friend to yourself. Baby shots, or immunizations, protect your infant against many serious diseases. The shots are so much safer than the diseases. Vaccines work best when they are given at certain ages. Your child needs a series of shots. If you have missed shots, don’t worry. You can start now. Call your doctor or clinic. Many communities offer free immunizations. Check with your public health office. Babies are scheduled for a series of shots that can be given anytime between 6 and 9 months old. This includes Hepatitis B, diphtheria, and flu, as well as polio. If you aren’t sure if your baby needs more shots now, call your doctor or clinic. How to play: Stand in front of a mirror with your baby and point to his reflection. Using his name, say, “I see Brandon. Where is Brandon? ” Encourage him to point to himself in the mirror. 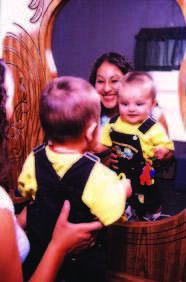 Then ask your baby, “Where is the ball?” and encourage him to point to the mirror. Your baby may enjoy sitting in front of a wall mirror and playing with his toys. Give your baby new foods one at a time. Don’t force a new food. If your baby doesn’t like it, put it away and try again the next day. 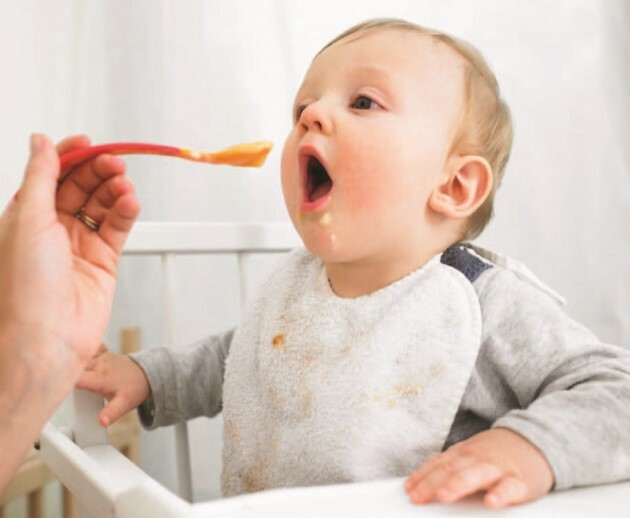 It may take seven to 10 tries before your baby starts to like a food. If your baby is interested, let him try to hold his own bottle or spoon. Also offer finger foods, such as crackers and dry cereal, so he will try to pick them up. It may take a while, but that’s OK. He’s learning a very important skill. 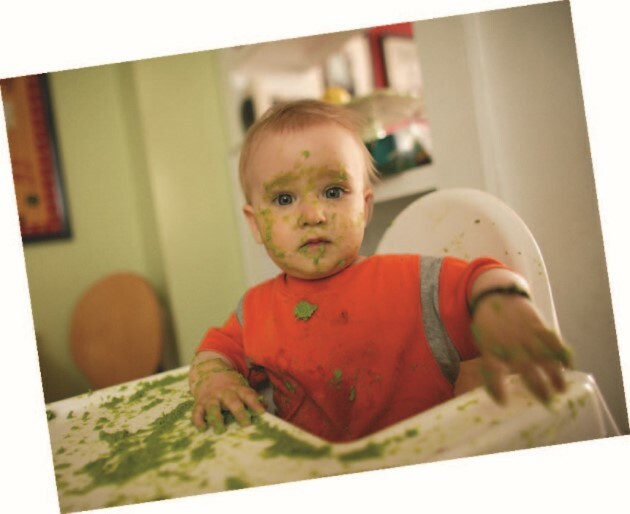 Your baby will be messy when he is first learning how to feed himself. Try not to become overly concerned about neatness now. A large plastic tablecloth under your baby’s chair will make cleanup easier. Check for the circle of safety when buying baby food. Do not buy jars that have the circle pushed up. Listen for a pop when you open the baby food jar. That will tell you that you have broken the vacuum seal, and it is safe to feed your baby. Serve and feed your baby from a dish, not directly from the jar. Don’t put leftovers from the dish back in the jar. You can refrigerate the unused baby food in the jar for two to three days. After your baby begins to eat an entire jar in one meal, then you can feed him from the jar. No sweet foods! Candy, sugar, sweetened cereal, sweet desserts (including baby desserts), fruit-flavored drinks, and soda pop are not good for your baby. These foods should not be fed to your baby because they will spoil his appetite for healthy food. These foods also are harmful to your baby’s teeth. Do not add sugar, sweeteners, or salt to your baby’s food. Have you thought about weaning? Experts on baby care and feeding want babies to continue to be breastfed until they are 1 year old. They believe breast milk gives the best nutrition a baby can get. If you are breastfeeding, try to keep it up. Your baby needs lots of love and attention. It’s also important to find time to nurture yourself and your relationship with your partner. Now that you are developing into loving and responsible parents and feeling more confident about parenting, find time for each other. Enjoy your hobbies, sports, reading, and other activities that energize you and reconnect you to each other. Healthy parents, who take time to keep themselves healthy, are just what children need. When you pick up your baby, bend from your knees and kneel or squat, keeping your back as straight as possible. Hold onto your baby, and straighten up from the knee-bend or squat position. Make your knees do the work, not your back. Do not bend over from your waist. When you’re out walking or shopping, you will see other parents and their babies. Stop and talk. Ask questions. It’s fun to compare notes. Ask how the baby has changed in the last one to two weeks. What is the latest thing she is learning? What is the baby’s favorite time of day? What does she seem to enjoy the most? You will have your own questions, too. Other parents will have their own tricks for soothing a crying baby or making feeding easier. Ask about them. Other parents are like you. They have learned a lot — and they love to talk about their babies! 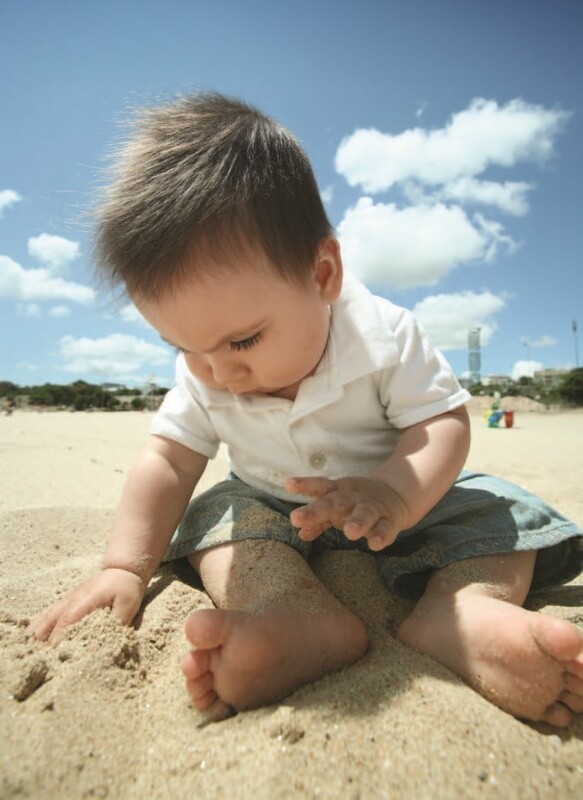 Babies need fresh air and light, but too much sun can be harmful. Researchers have found that severe sunburns in childhood can lead to greater risk of the most deadly form of skin cancer, malignant melanoma, later in life. Before 6 months keep your baby out of the sun. After 6 months, always put a sunscreen lotion with a 30 or higher sun protection factor (SPF) on your baby and yourself when you’ll be in the sun. 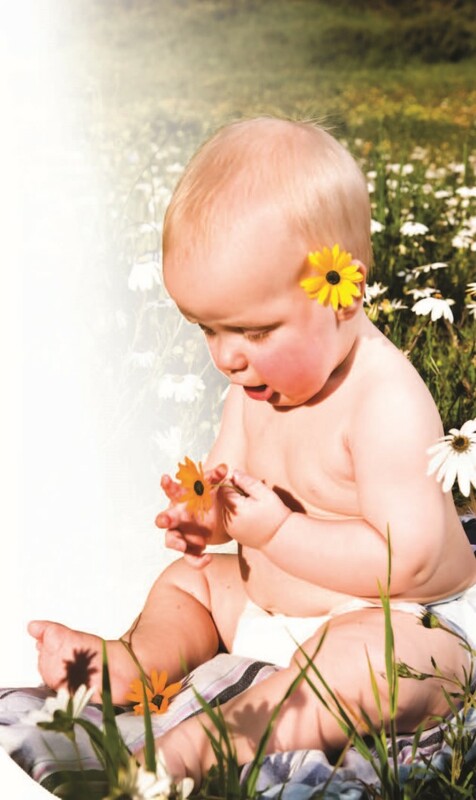 Test a small area of your baby’s skin to check for a reaction before applying all over. Re-apply every two hours. Stay out of the sun from 10 am to 3 pm, when the sun’s rays are strongest. Keep your baby in the shade. If you use a stroller, keep the sun shade on. Put a hat on your baby, and dress him in lightweight clothes that cover his body. Dress like that yourself. If you or your baby gets sunburned, put cool, wet towels on the burns. If a fever or blisters develop, call the doctor. I creep on my stomach and may crawl. I keep my legs straight when you put your hands under my arms and pull me up. I try to stand by myself. I may fuss because I don’t know how to sit down. Show me how to do it. Be careful not to lift me by the arms. My bones can still be easily dislocated. Lift me by putting your hands under my armpits. I feed myself foods I can pick up, but I’m pretty messy! I say several sounds such as ma, mi, da, di, and ba. I like to see myself in the mirror. I like toys that make noise such as bells, music boxes, and rattles. I can pay attention to things now and I spend lots of time studying things. I can grab things and hold on to them, but have trouble letting loose. I may straighten my whole arm and fling things down because that’s what works. I may be afraid of strangers, so stay with me when they’re around. Some children do things earlier or later than described here. Most differences are normal. Focus on what your child can do and get excited about each new skill. If you notice that your child is lagging behind in one or more areas for several months, circle the things that your child cannot do. Check the things your child can do. Use this list to talk with your doctor about your child’s development. Your baby is learning about good and bad feelings. Help him by talking about emotions. Say, “You fell over and are crying. You feel bad. Let me help you up. Now, you’re feeling better.” Learning about our emotions takes a long time. The first steps begin right now. Your child’s tears may be hard to take. It will pull at your heartstrings to see your little one feeling such pain. But tears are a sign of healthy emotional growth. Your baby is reacting the same way you would when you trip over a bump in the sidewalk, fall down, and get drenched in the rain — all on an empty stomach. Tears can be good medicine — they help us relieve tension, reduce stress, and get us ready to bounce back to feeling better in a short period of time. Tears help us deal with bumps in the road. One of the most important things that babies do is become attached to their parents and other important adults in their lives. You’ll know that your baby is getting attached when he starts to cry when you leave. This does not mean that your baby is spoiled. It’s a sign of attachment. This will set the foundation for healthy relationships throughout his life. Around 7 months of age, babies may start to act differently around the people they know and the people they don’t. 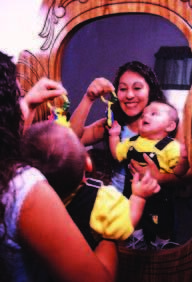 Your baby will talk, coo, and laugh with the people he sees every day. But when a stranger, perhaps even a grandparent, picks up your baby, he may be quiet or even scream. This is normal. It’s a sign that your baby is picking up on the differences in people. Your baby is learning that not everyone is the same. He is likely to accept new people after he has spent some time with them and knows he can trust them. Researchers have found two types of play between parents and their children. One style is similar to a professor lecturing to a class. 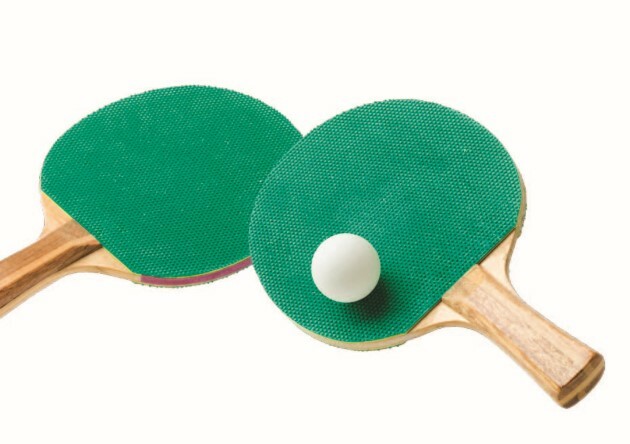 The other style is called “ping-pong” because it’s similar to a ping-pong ball going back and forth between parent and child. Lecturing doesn’t help babies learn. “Ping-pong” is best. To be a ping-pong-type teacher, do this: When your baby giggles, you giggle. When your baby hands a block to you, hand two blocks back to her. When you do something, your baby will react to what you do. The best learners have adults who spend time playing with them. Did you ever stop to think why you don’t like some foods? Most people like the foods they were given when they were young. If you give your baby a variety of nutritious foods now, she is more likely to eat foods that are good for her, during her whole life. What a wonderful gift to give her! Children copy their parents, brothers, and sisters. If your baby sees her family eating healthy foods, she probably will, too. Make meals happy and relaxed times. Feed her with the rest of the family. Feed her as much as she wants, but don’t force her to eat more than she wants. Prevent choking. Do not give your baby small, firm, and slippery foods such as peanuts, raisins, whole grapes, hard candy, popcorn, raw carrots, or hot dogs cut into circles. Some people think it’s OK to cut foods into small circles for babies to eat, but this size of food can get stuck in their throats and choke them. As your baby gets around more on his own, life is more exciting. It is also scary and frustrating. Temper and frustration begin to show. Your baby moves into another room to explore and satisfy his curiosity. He doesn’t see you, so he gets scared and starts to cry. If you leave the room, he begins to scream because he is frightened of being away from you. He might drop a toy out of sight. He screams with anger because he can’t see it or get to it. He wants it back. Temper and frustration are normal. Help your baby learn ways to deal with frustration. If your baby drops a toy, help him look for it. If you leave the room, tell your baby you will be back. Give him some extra cuddling during these bursts of independence. 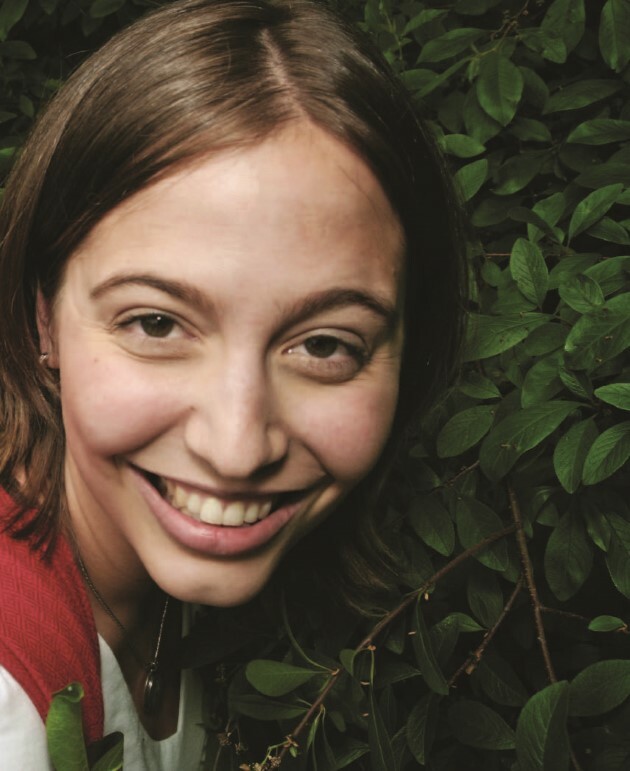 When your baby is pulling leaves off your favorite plant — one by one — or smearing cereal in her hair, it’s hard to stay calm. If tempting things such as houseplants and wastebaskets are left in your baby’s reach, she will explore them. The easiest way to keep her out of trouble, and you relaxed, is to put “do-not-touch” things where she can’t see or reach them. Babies do things that are upsetting to parents, but they don’t do these things on purpose or to annoy you. When your baby bangs toys together, it’s because she likes the noise. If it gets on your nerves, give her a quiet toy and take the noisy toys away. Keep your baby safe. A baby can drown in 2 inches of water. Never leave your baby alone in or near a bathtub, toilet, pail of water, or pool — not even for a moment. Remember, your baby is not doing anything to try to upset you. She’s busy learning about her world, and that learning can get messy and noisy. 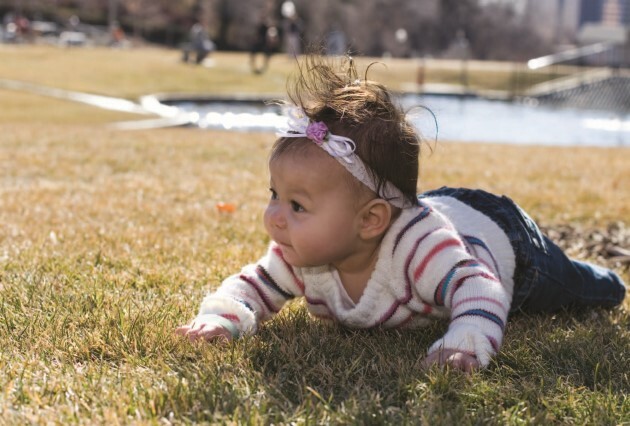 When you see things from your baby’s point of view, you will feel less stressed. 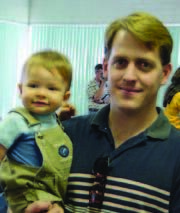 For more parenting information, including frequently asked questions and a chance to “Ask the Expert”, go to www.extension.org/parenting. Text4baby will send free text messages to your cell phone with health tips for you and your baby. It’s all free! To sign up, text BABY to 511411 or go to www.text4baby.org.